DreamWorks Is Developing More ‘Rocky and Bullwinkle’!! It looks like DreamWorks Animation wants more ‘Rocky & Bullwinkle‘ material, because they just announced that they will be releasing an all-new short film featuring the classic characters in animation form sometime in 2014. I’m willing to be it will be in March, since DreamWorks also announced that their new animated feature ‘Mr. Peabody and Sherman‘ will be released then as well. I guess they thought that we all forgot about the 2000 live-action version ‘The Adventures of Rocky & Bullwinkle‘ that starred Rene Russo, John Goodman, and Robert DeNiro, because that is one of the worst films ever made. But maybe they are testing the waters with a short, in order to make a new feature length one. I’ve always enjoyed the classic cartoons, but can’t get behind the whole CG 3D animation with this particular cartoon. There is just to much nostalgia with it. 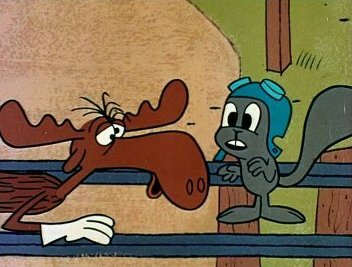 And who knows if Rocky and Bullwinkle will show up in the ‘Mr. Peabody and Sherman’ film, after all, they were part of the old ‘Rocky & Bullwinkle’ shows when it was called ‘Peabody’s Improbable History‘. You can check out the trailer for it below. DreamWorks Animation Inks Deal with Netflix for Original Programming!! Bob’s Burgers Movie is Coming in 2020! This entry was posted on Monday, November 4th, 2013 at 11:30 am	and is filed under Film, News. You can follow any responses to this entry through the RSS 2.0 feed. You can skip to the end and leave a response. Pinging is currently not allowed. « ‘Top 3 Action Movie One Liners’! !